Do you own or manage a hotel and are in need of convenient ways for your guests to secure their belongings. Value Safes offers a variety of options including our selection of hotel and hospitality safes. When it comes to finding a high-quality safe, you can end your search by taking advantage of our sales. We have many terrific options to choose, and all of our hotel and hospitality safes come complete with a long list of features. Just some of what you can expect any time you purchase our hospitality safes include electronic keypads, bolt down hardware, pry resistant doors and much more. From jewelry to hard drives, these safes are perfect for storing just about anything. Browse our online catalog and click on any of our product pages to view additional details about each high security hotel and hospitality safe for sale. Once you place your order, we ship your safe immediately. For more information about a specific safe, or about our services in general, contact Value Safes today to learn more from a helpful member of our team. Half Price Sale! The Hollon ES-20 featuring an electronic keypad is perfect for safeguarding laptops and other personal valuables from theft. The safe features a sleek design and simple black color. Batteries and bolt down hardware are included. This is the perfect addition for hotel or motel guestrooms, as well as hospital rooms. Bolt down hardware included, override key included, one user electronic keypad, lock out mode after 3 wrong entry attempts. 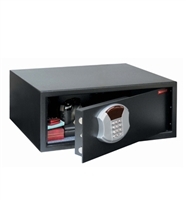 The MESA Safe Company MH101 Safe features a 100% battery operated electronic lock and keypad. Perfect for a hotel or motel, this safe includes a pry resistant recessed door that will deter thieves and offer more protection. Override the electronic lock at any time using the included mechanical override keys. This safe weighs 25 lbs and takes up 0.4 cubic feet of space, small enough to fit almost anywhere. For more information on this safe or others, contact us! The MESA Safe Company MHRC916E Safe features a battery operated electronic keypad lock that comes with an emergency mechanical override key. Great for a hotel or motel, this safe includes a pry resistant recessed door to offer more protection and keep thieves at bay. This safe weighs 35 lbs offers 1.2 of interior cubic space. It is small enough to fit almost anywhere, and features anchor holes to easily secure it to the wall or floor. For more information on this safe or others, contact us! The Honeywell Small Steel Security Safe 5105 is one of our highly secure safes that are perfect for an office or hotel. Featuring 1.0 of interior cubic feet, this safe will also fit large laptop computers in addition to other items. The safe opens using the easy LED electronic keypad, which comes with an emergency override key. Extra security is provided from the included concealed hinges, live lock bolts, and recessed door. For more information on this 35.5 lb. safe, contact us today!